How do electric patio heaters work? Electric patio heaters use infrared radiant heat to create warmth. This type of heat is especially effective in outdoor areas as radiant heat doesn’t require the movement of warm air to be felt. Radiation travels through the air unhindered and directly heats the people and surfaces with which it comes into contact. 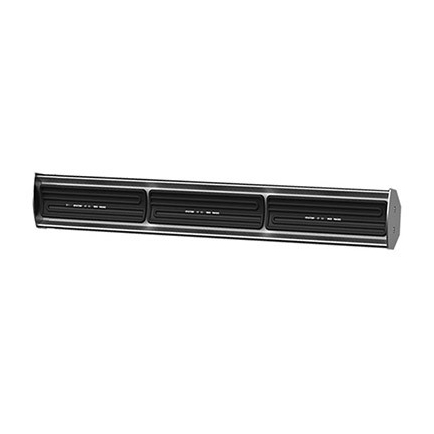 Our infrared patio heaters can be roughly split into two categories: quartz heaters and ceramic heaters. These products both create radiant heat but use different heating elements to produce this warmth. Quartz heaters, or halogen heaters as they are also known, use a tungsten filament which is heated via electric current to a temperature exceeding 2000° C. They get their name from the quartz tube filled with halogen gas which serves to protect the filament and give the heater a longer lifespan. These kinds of heaters use intense shortwave radiation, known as near infrared, to produce instant heat that works well for outdoor use. Ceramic heaters work by heating a coil of wire that’s encased inside a ceramic plate to conduct heat. Their elements don’t reach temperatures as high as a quartz heater and are instead designed to produce a more mellow warmth that can be used comfortably over a long period of time. Ceramic heaters use longwave or far infrared which requires a longer heat up time before its effects can be felt, but this kind of radiant heat is more easily absorbed by the body and provides a more versatile heat suitable for both indoor and outdoor applications. What are the benefits of outdoor heaters? Sadly, we are not blessed with predictable weather in the UK and our patio seating areas can go unused for months on end. Often the temperature is just a tad too chilly to allow us to sit outside even if the skies are relatively clear, and the slightest breeze can make a mild day feel quite brisk. An outdoor heater can help you get the most out of your garden by keeping the areas you use most warm whenever the occasion calls for it. Instead of limiting the use of outdoor areas only to the warmer months, a dedicated heat source will help you use these spaces throughout spring and autumn too. Outdoor heating should always be a consideration for businesses that have alfresco dining areas, such as cafés, bars and restaurants. Well-heated outdoor areas will help to maximise seating capacity and encourage more patrons to stay and enjoy a warmer environment. Heaters can be wall mounted, used free standing or even attached to the undersides of large parasols, so there are plenty of installation options available to suit every application. What size patio heaters do I need? Before you decide on a product, you’ll need to judge what areas of your outdoor space you want to keep warm. For domestic spaces, this will usually be a relatively small area defined by where you prefer to sit on your patio. Commercial settings tend to require a lot more calculation to take into account all of the different spaces that customers use. Once you’ve estimated the heating area required, you should use this figure to find a product, or combination of products, with “heats up to” values sufficient to cover the space. Every patio heater in our collection specifies what size area its heat will cover in ideal conditions; however, you should round this value down if you’re intending to use the heater in a particularly exposed location where the heat will have to compete with wind-chill and harsh weather conditions. We always suggest choosing a product that’s a little higher than your requirements as this will ensure your outdoor seating areas are as well heated as possible and will be able to combat the colder temperatures felt in more exposed locations. If you’re unsure what product is best for your project, give our expert sales team a call. They can provide advice and recommendations based on your requirements and even create a free, no obligation quote. Do all electric patio heaters glow? The glow created by electric patio heaters can divide opinion. For some, their orange light can be a welcome addition to nights sat outside on the veranda. For others, it can be a garish nuisance they could do without. Thankfully, there are outdoor heating products to suit every taste, no matter what side of the fence you sit on. Standard quartz heaters that use near infrared will usually emit an orange light because the type of radiation they use is more intense and requires the heating elements to reach very high temperatures. For those that find their glare too harsh on the eyes, low glare or ultra-low glare products are available which are tailored specifically to reduce this effect. These products use specially coated reflectors and filters to minimise light production, allowing you to enjoy the invigorating heat of near infrared but with less of the associated glow. 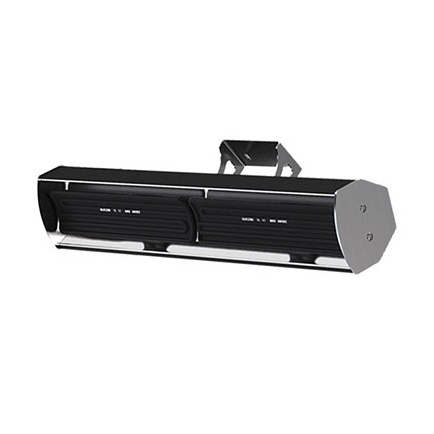 For a completely discreet solution, you can purchase patio heaters that produce no visible light at all. No glare heaters use ceramic heating elements to emit infrared heat and can be the preferable solution if you want your patio heater to be inconspicuous. No glare heaters use a gentler form of infrared that’s much closer to longwave far infrared and operate without producing any form of light at all. The trade-off for having a heater that produces no light is that the gentler type of heat they produce can take a little longer before its effects can be felt, but this is usually the best solution for anyone who wants to side-step the issues associated with glowing heaters. How are outdoor heaters installed? All wall-mounted outdoor heaters need to be installed by a professional electrician as they require hard-wiring to the mains. The only electric outdoor heaters that can be assembled completely DIY are portable heaters designed for plug-in use. You will also find some wall mounted heaters which can be mounted on tripods and used free-standing. In both these cases, the heaters should not be left out unattended unless you’re using a waterproof socket. As with any other heater or electrical appliance, patio heaters are safe so long as they are used sensibly and to the manufacturer’s specifications. Always make sure that any heater you install adheres to the manufacturer’s guidelines concerning distance from combustibles. The heating elements inside patio heaters get very hot, and it’s possible for materials to ignite if they come into close proximity. For the same reason, it’s important not to leave freestanding heaters unattended as these can be knocked over by children or animals, potentially causing a hazard. The use of infrared radiation as an outdoor heating solution is not a new one and we have in fact been using it for years in the form of open fires, which give off the same type of radiant heat. Despite this fact, many consumers will hear words like ‘radiation’ and ‘infrared’ and assume that electric outdoor heaters will cause them harm. In fact, this could not be further from the truth. There are two main forms of infrared used in patio heaters. Far infrared, used in ceramic or “no-glare” patio heaters, and near infrared, used in quartz or “low-glare” patio heaters. Far infrared is a gentle form of heat that can be used comfortably for hours on end. It’s so safe it’s even used in incubators for babies. Near infrared is a more intense form of heat that also gives off an orange glow. Near infrared is more useful for short blasts of heat in exposed areas that need a high temperature to compensate for wind-chill and the effects of the weather. This form of infrared can become uncomfortable if you spend a long time under the heater, simply because of the higher temperatures reached, but that’s as far as the health considerations extend. Providing you use your common sense, all infrared outdoor heaters are safe to use and will enhance your gardens and patios with reliable heating all year round. What IP rating do I need from my electric patio heater? IP ratings are a standard used to quantify the level of protection offered by electrical appliances against the ingress of solid objects and water. Customers should be aware of the IP rating of their chosen heater if they intend to install it outside, where it will inevitably be exposed to windblown rain, dust and debris. IP ratings consist of two numbers preceded by the letters ‘IP’, e.g. IP65. The first number represents the protection level against solids and the second number represents protection against water. You should choose a heater with an IP rating that ends in at least ‘4’ if your heater is going to be installed in an outdoor location, e.g. IP24. Level 4 indicates that a product is protected from splashes of water in all directions. This provides ample protection from rainfall and is sufficient for most outdoor locations such as restaurant terraces or back gardens. Anything less than this will be unsuitable for an outdoor location. Heaters that are exposed to frequent harsh weather will require a rating that ends in a ‘5’ or higher, and the same is true if they’re installed in industrial areas that may be hosed down to clean. For a more in-depth look at IP ratings, check our handy guide to find a level of protection suitable for your project. If you’re still unsure what rating you need for your installation, our sales team will be able to provide expert advice and even create a free quote for your consideration. If you’re looking for an effective outdoor heater that guarantees a pleasant warmth, there is no substitute for infrared. Waves of radiated heat directly warm objects, surfaces and people which minimises the heat lost through air circulation and therefore reduces energy consumption. 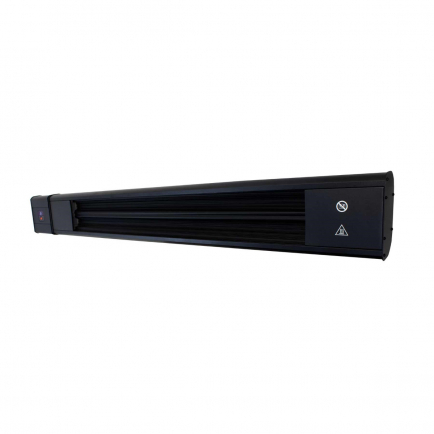 We have a variety of infrared heaters suitable for a range of applications, from small, portable heating solutions for patios and gardens to commercial heaters for difficult to heat, draughty spaces such as warehouses, workshops and factories. 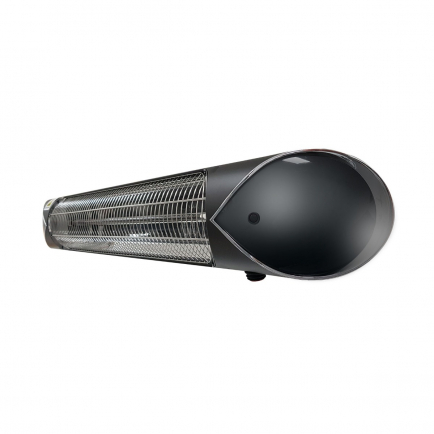 Browse our range for the perfect outdoor heater for your home or business.